I've been doing a good job at reading more non-fiction this year and of focusing most of it on voices that need to be amplified or remembered. 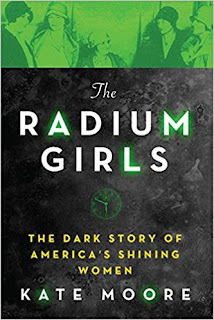 The Radium Girls: The Dark Story of America's Shining Women by Kate Moore definitely helps me toward my goal. This is a story of women who were taken advantage of and then dismissed. It is wonderful that now their names and stories are in the spotlight. When radioactive elements were first discovered, not even the scientists working with them knew of their dangers. And, of course, businesses jumped on board and started taking advantage of these new, amazing elements before those dangers could be discovered. Radium was used in many applications, one of which was painting clock faces and airplane dials so that they would glow in the dark. This seems like a worthy use of radium, especially as the world was at war. However, this paint was applied by teens and young women ... with minuscule paint brushes ... that they could only get a fine enough point on by "pointing" them in their mouths. This book is not an easy read. 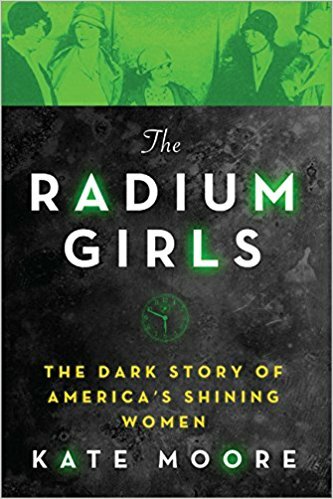 Based on our modern knowledge of radioactivity, we can already guess at the physical horrors that were in the futures of these women and they are talked about in gory detail. But the true horrors turned out to emanate from the businesses that betrayed them, denied them money and health care, and straight up lied to them even when the truth started to be revealed. In an age where certain people in high places think that industry is over-regulated, this story stands out as a stark reminder of why those regulations were created in the first place. So, though it is hard to stomach, I think this story is essential reading. This is one I really need to get to! It's long but reads quickly. This is one of the non-fiction books I really want to read this year. These women deserve to be remembered and have their stories told. Absolutely. The fact that at first they were slandered and accused of having STDs was heartbreaking. Although this wasn't an easy read, I loved it so much! 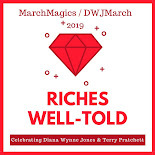 I thought was really engaging, I admired what these women accomplished, and it made for great discussion in my book club. I agree it's essential reading. Especially as the US gov't seems to be pushing for less regulation, it seemed like a good reminder that often companies won't do the right thing unless they're forced to. It does sound difficult to read, but valuable to remember the history and see it as a cautionary tale. I am not a fan of deregulation myself. These are definitely the types of stories we need to be able to easily recite and bring forward if we are going to fight to save the progress we've made. Good review! I have this one, but the couple of times I've started to read it the descriptions early in it always get too me. It's a tough read, hoping I can get to it soon! Those descriptions come and go in the book, wedged between tangents on law and biology and other topics so that it's a bit less overwhelming. But when you first encounter them, it's definitely rough!